A vice president at Monster.com once attempted to pay me for a freelance job with a lightly used copy of Stephen King’s It. This is an absolutely true story, and the craziest part is that I accepted the offer! Why would I accept a job for such meager pay? Well, there are a few good reasons. It was a partial payment – I think I also got five bucks in cash. This was twenty years ago, when Eric and I were high school classmates. At the time, I was a freelance typist who typed reports for a sizeable chunk of my class. I’ve always been a fan of Stephen King.I’m not sure that he has ever been my absolute favorite writer, but as other writers have jumped to the top and later dropped into the category of also-rans (sorry, John Grisham, but this describes you) King has been a mainstay in the top 5. While King draws the largest following for his supernatural tales, I’ve always felt that he was at his best when he writes “straight” fiction. I’m sure there are many who don’t realize that the movie The Shawshank Redemption is based on a King story (you can find it alongside another great tale, Apt Pupil, in the novella collection Different Seasons). I’m digressing, but my point is that 11/22/63 is a book without any of the supernatural themes many would expect from a King book – unless you’re the sort of person who finds the idea of time travel to be supernatural. Nonetheless, King spins a grand tale. The premise is that Jake Epping, a high school English teacher, goes back in time in an attempt to prevent President Kennedy from being assassinated. The proprietor of Jake’s favorite greasy spoon is on his deathbed when he confides a secret to Jake. He has found a porthole into the 1950s. All Jake needs to do it pop through the porthole, determine that Oswald acted alone, and whack him. While he’s at it, correct a few more wrongs while he’s at it. Need some money? No problem – just bet on sports. Sounds simple enough, but as Jake finds out, the past is obdurate (Jake’s favorite word) – resistant to change. At each step, the past puts obstacles in his way – some subtle, some not. And each time Jake does something to change the past, the butterfly effect means that the future may also change. Does Jake succeed in his mission? Sorry, but I’m not going to include a spoiler in a review – you’ll have to read the book to find out. I have a casual interest in history, but I’m not obsessed with Kennedy by any stretch of the imagination. 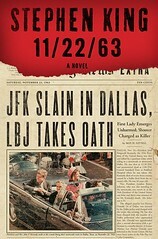 Before reading 11/22/63, I knew the basic details of the Kennedy assassination. While King necessarily fictionalizes the past in order to advance the plot, much of the content is based on fact. Quite a lot of the book focuses on Lee Harvey Oswald and his family. If you’re not terribly familiar with the Kennedy assassination, you might actually learn some history from the book. As is generally the case with King, his characters are interesting and multi-dimensional. Jake himself fits the bill of a complex character, of course. He’s a mild-mannered teacher who is now willing to blow a man’s brain’s out. As Jake settles down into a “normal life” for a few years while he does the necessary background on Oswald, he interacts with a rich cast of characters who make him feel at home – rather than an alien from the future. His life becomes entwined with their lives to a degree he never could have imagined. The book includes a full array of characters. Although the main plot of the books is Jake’s mission to save Kennedy, many other subplots develop as the book moves along – which each subplot spinning up new protagonists and antagonists. Schoolteachers, bookies, murders, self-righteous women, kids, communist sympathizers – 11/22/63 has them all. King also does a great job of setting the scene with his descriptions of the environment. You can visualize the inside of the diner and can easily hear the children playing jump rope – and, of course, you can see the bruises on Lee Harvey Oswald’s wife. I found it very easy to get immersed in King’s version of the early 60s. I loved the book. It’s long – 849 pages in hardcover – but I doubt you’ll find many boring passages. If you buy the Kindle version, you have two options. You can pay a few extra bucks and get a version with some extra media included. Alternately, you can simply buy the bare bones edition (currently $14.99). Since I was buying it just for the story, I opted for the cheaper version. Don’t have a Kindle? You can buy one here (for as low as $79).